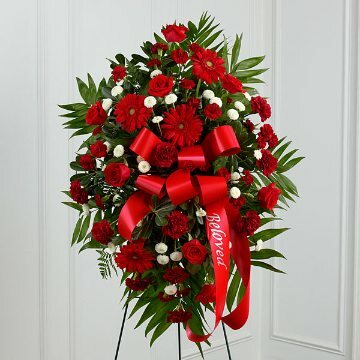 The FTD® Treasured Memories™ Standing Spray is a rich and colorful way to express your unending love and devotion to the departed. An exceptional arrangement of red roses, burgundy carnations, burgundy mini carnations, red gerbera daisies and white button poms are accented with a variety of lush greens. A red ribbon with the word, "Beloved", embossed in a gold metallic lettering, finishes this beautiful display for their final farewell service. Displayed on a wire easel. Approximately 46"H x 30"W. Please allow 6 business hours for a service arrangement to be prepared.